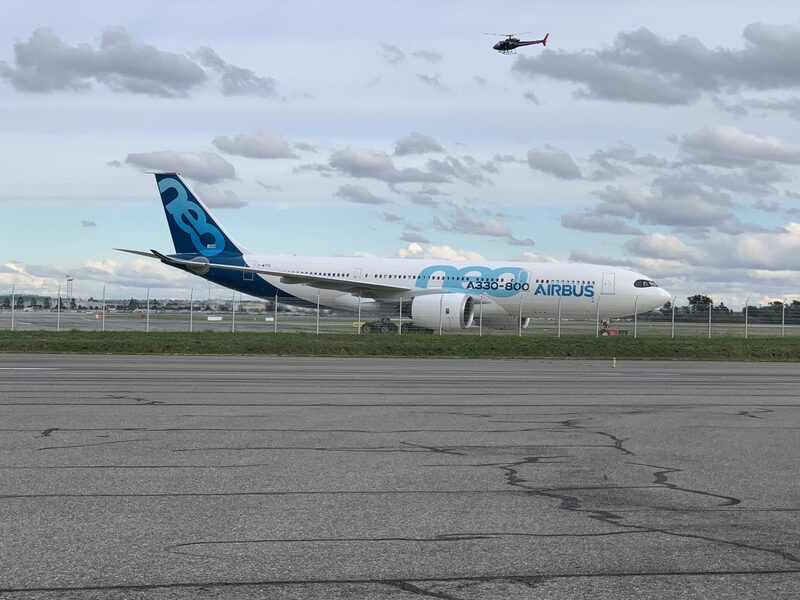 Taking a quick last-minute trip to Toulouse to see the maiden flight of the Airbus A330-800 feels like a can’t-miss opportunity, but it can also disrupt one’s work plans. Air France’s app and productivity services at Paris Charles de Gaulle Airport (CDG) saved the day for your author. Finding Wi-Fi on board my Air France flights would have been icing on the cake, but the airport experience covered the gap. I have written many words for various industry publications arguing that airlines and airports need to cater to the “invisible productivity flier” – the freelance professional. That’s because the number of freelance workers in the gig economy is growing dramatically. Freelancers now represent more than a third of the US workforce, and are the fastest growing group of workers in the United Kingdom, France and the Netherlands. The gig economy is a global phenomenon which is shaping the future of business and setting lifestyle expectations. And freelancers, like me, work differently. 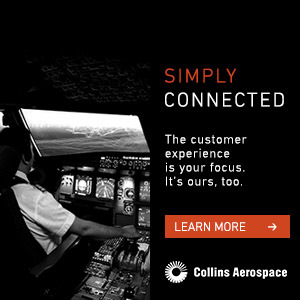 We rely heavily on digital tools, don’t generally hold to a 9-5 schedule, and appreciate passenger experience (#PaxEx) features that let us keep up with assignments wherever we might find ourselves. 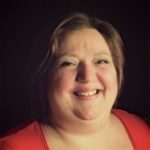 These independent contractors don’t fall into the neat little “road warrior” box for business class passengers, with corporate travel departments to back them, and for whom airlines dedicate a large share of their marketing and advertising budgets. The reality is that freelancers are busy with their own battles every moment of the day. They need to be productive on the go. I flew to CDG out of Denmark’s Billund Airport on a very light Monday afternoon, with only two individuals in front of me at security. Billund caters to productivity fliers by offering free, unlimited high-speed Internet, with no need to register. There is also an abundance of round tables and chairs where you can sit down comfortably and work around the terminal, and even at the gates. The 1hr 50min HOP! 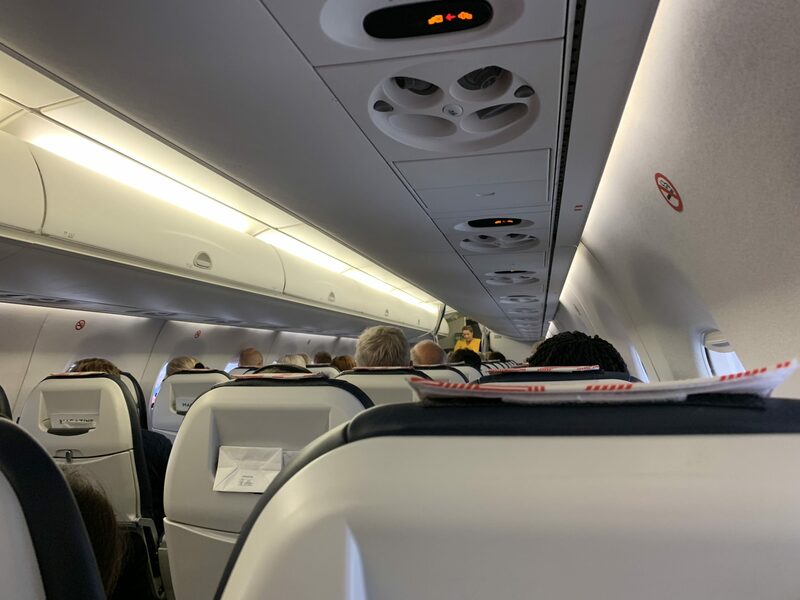 flight (AF1265) to CDG was on an Embraer 170 regional jet, with a 2-2 seating configuration. 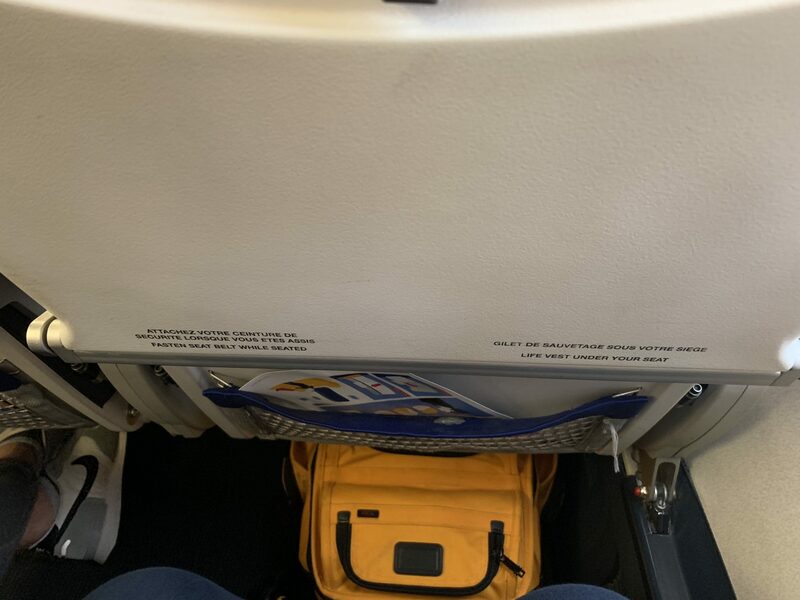 Being on the shorter side, I don’t usually find legroom to be a problem, but it was a tight squeeze navigating my larger backpack under the seat in front of me. 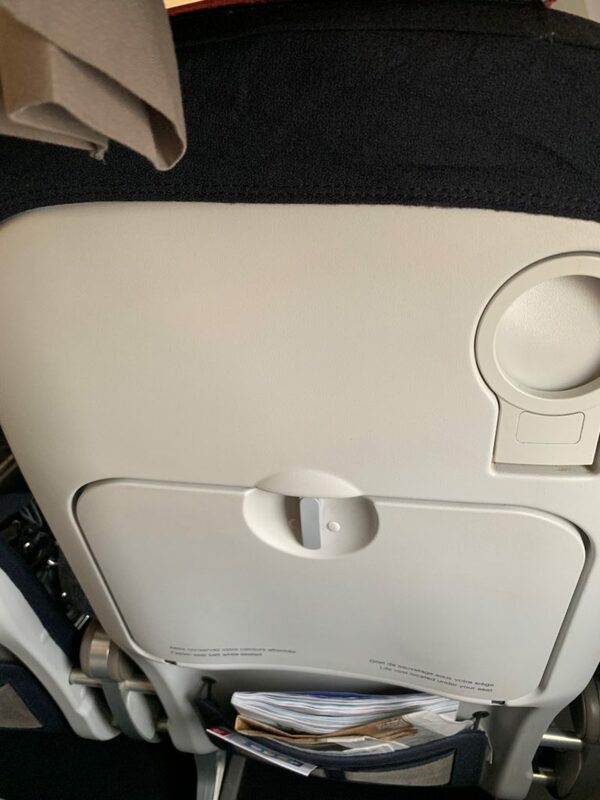 It is 25cm deep and was flush to the space between the end of the seat cushion and the magazine pocket in front. There were some acrobatics required to get this overnight trip bag under the seat, but I managed. In Europe, flights that offer Wi-Fi are still somewhat rare, and it’s a novelty when the service is available. 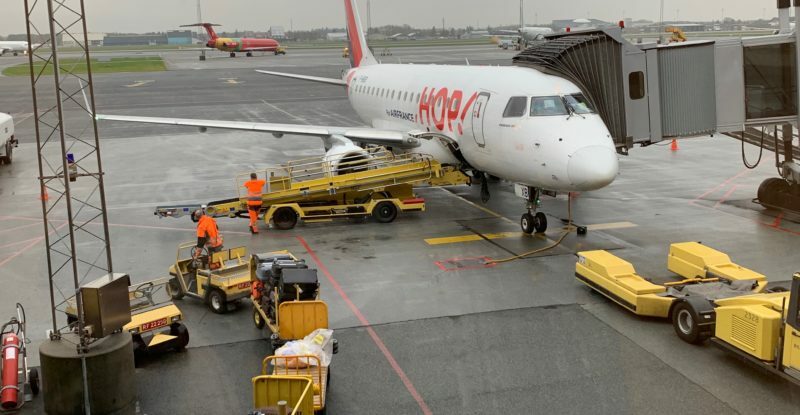 Air France/KLM hasn’t added Wi-Fi to the lion’s share of its short-haul fleet yet, including HOP! E-Jets (though Air France has started equipping its A320s), so I took time on these flights to catch up on some reading. I landed at CDG Terminal 2G and my connection was at Terminal 2F but the bus service was quick and not at all overcrowded. The 2F terminal is large, and has a variety of attractive shops, but I had urgent stuff to do. 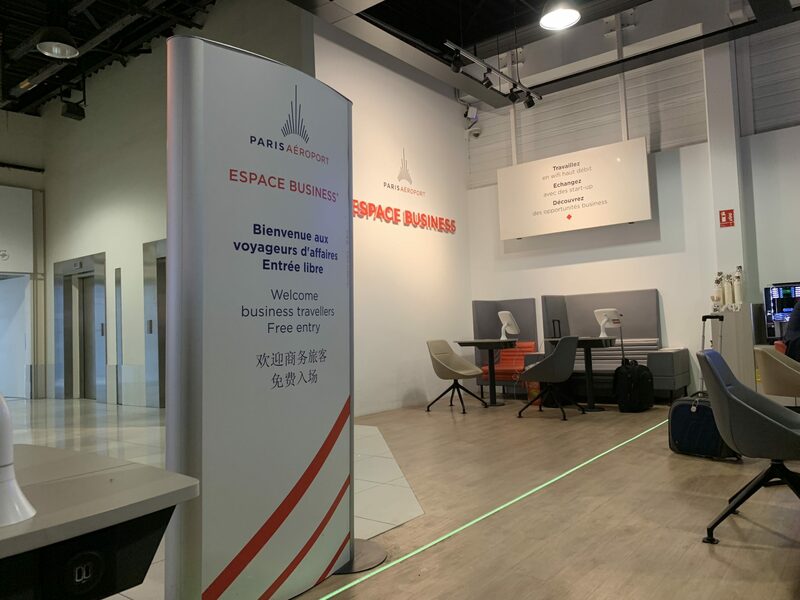 Fortunately, both 2G and 2F offer dedicated business spaces, featuring comfortable cubicles, bar chairs with power outlets, and even small touchscreens that offer information on flights and airport services. There is a coffee machine in the business zone too, but I had no coins to operate it and wasn’t clever enough to figure out the app to pay for a drink. It would have been more convenient to pay with NFC, but honestly I’m just nitpicking. There is also free, fast Wi-Fi available at the airport, though I used the free roaming 4G data connection on my mobile plan. After filing an article, I walked down to the Starbucks, which also offers room to work and limited power supply, ordered a venti cappuccino and a bottled water, then finished a second story before making my way to my gate for flight AF 7526. The Air France Airbus A321 serving CDG-Toulouse was configured in a traditional 3-3 layout, with decidedly slimline seats. The latch on the tray is a bit soft, something I noticed on both outbound and on the return. It’s possible to deploy the tray by accident, just by brushing past it. 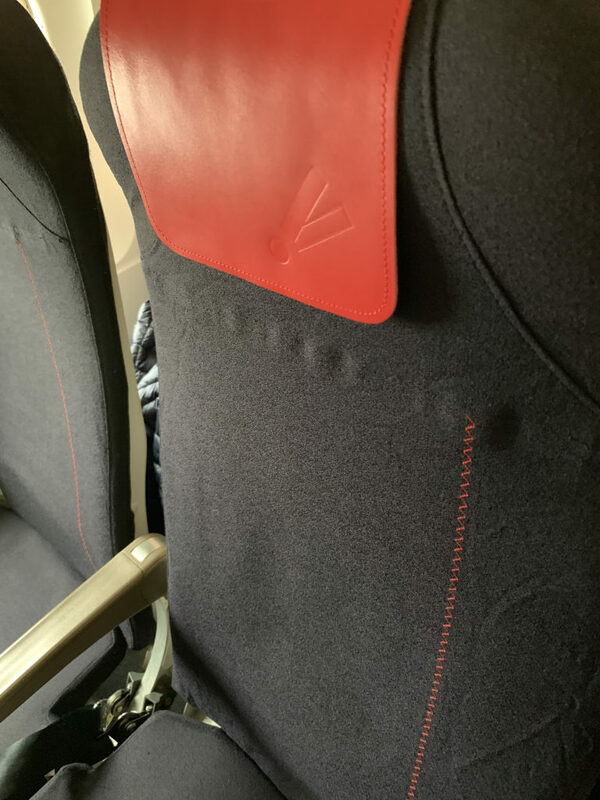 I like seeing a cup holder on a seat – which leaves a little more room on narrow trays – and I found the Air France stitching detail on the blue fabric dress covers endearing. It creates visual interest and ties-in to the red leather antimacassars. We had a bit of excitement arriving at Toulouse late in the evening, with a last-minute aborted landing due to cross winds. It was, as they say, a dark and stormy night, which made me wonder whether we’d all be disappointed the next morning. Airbus managed to have a good talk with someone upstairs and we enjoyed clear skies from the A330-800’s takeoff right up to landing, then the skies swiftly went grey again. Toulouse Blagnac Airport is going through a lot of construction right now, with improved concessions on offer in the near future. But there is a good cafeteria offering refreshments and a place to sit and work immediately after the “duty-free” gauntlet at security. During my wait for my final flight home at CDG Terminal 2G, I took advantage of the very welcome business zone again. I still couldn’t figure out the coffee machine, but perhaps one day I will. Editorial Disclosure: Travel and accommodations for this trip were covered by Airbus. All opinions and accounts of the service come solely from the author. Gracias Marisa ! A tus ojos no escapan hasta ni los más menores detalles, conoces bien tu tema = APEX ! Me harías mucha ilusión si tuvieses la oportunidad aquí – como freelance de RWG – de visitar la cabina de nuestro H21QR con VR goggles en experta de APEX ?